Ricoh MP 305+SPF Printer Driver. This Ricoh MP 305+SPF is a A4 multifunction compact is ideal for small and medium-sized offices that need to print in A3 size. Print at a speed of 30 pages per minute and is equipped with Smart Operation Panel, an intuitive and easy to use panel that allows you to manage documents directly from the multifunction. For silence and compactness, this device is the ideal choice for those who want a complete multifunction that takes up little space in the office. The ability to print in A3 format is just one of its strengths. 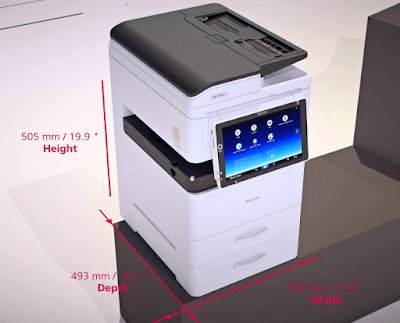 In fact, this device offers fax functions, a 10.1-inch Smart Operation Panel and the possibility of using Smart App. Ricoh MP 305+SPF is so compact that it can be placed in a corner of the desk and so silent that it does not disturb the concentration of the worker. Prints, faxes, copies and scans are always at hand: work never stops. Ricoh MP 305+SPF has compact design and placed on desks and workbenches. Fax functionality in "Smart" A4 multifunction with the possibility of using the A3 format from the bypass tray with native applications and ease of use thanks to the intuitive 10.1-inch touch panel also low running costs thanks to the "ready to use" all-in-one configuration.